Bouquet of flowering noxious weeds, harvested in early June along the open space trail below the Mount Jumbo saddle trailhead. Photograph by Eric Edlund. It’s getting to be that time of year, and I’ll bet you haven’t bought a Father’s Day present yet! How about a bouquet of flowers? “No way!” you’re saying, “that sounds a little too ‘girly’ for my Dad”. Well alright then, how about giving him a bouquet of noxious weeds? At this time of year, on public lands all around the Rattlesnake Valley, there are some very pretty flowers that also just happen to be classified as noxious weeds. 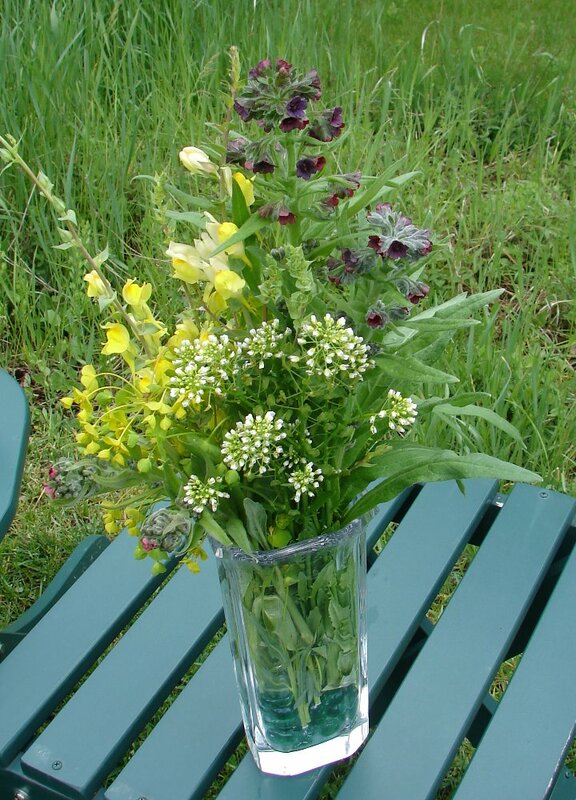 The four species shown in this bouquet (houndstongue, Dalmatian toadflax, leafy spurge, and hoary cress or whitetop) were all gathered in the open space below the Mount Jumbo Saddle trailhead. Hand-pulling can be a useful tool for weed control, and when the ground is wet it’s not that hard to get most or even all of the root. It’s probably best to wear gloves, because some of these plants contain skin-irritating chemicals. Dalmatian Toadflax is a long-distance colonist. If you find a small patch of toadflax, you can prevent it from spreading by hand-pulling all the plants. (For this and any of the weeds listed here, don’t feel bad if you don’t get the entire root–the sad truth is that for most weed species it will take several years to eradicate a patch). Leafy spurge and whitetop (a.k.a. hoary cress) are harder to contain with hand-pulling–they’re really abundant. You’ll almost never get the entire root of a spurge, and in fact, breaking the plant away is likely to stimulate vegetative root growth and help spread the plant. Even young plants have breakable nodes on their roots that will probably stay behind when you pull the root. Still, like toadflax, if I find one or a few small plants far from any heavily-infested area, and the ground is wet, I’ll go ahead and pull them. Houndstongue, on the other hand, is potentially-easy to control. It’s a biennial with one main taproot. It’s worth pulling, especially when the ground is wet. Any one plant typically lives only two (maybe three) years–so even if you don’t get the root, if you remove the flowers, the plant is living on borrowed time. But watch out–houndstongues will often sprout a second or third batch of flowers in a single season, and if you don’t get their root, they’ll be back to try again for at least one more year. Watch out for last year’s dead plants too–they may be covered with sticky seeds that are best removed from your pets and clothing using a fine-toothed comb. 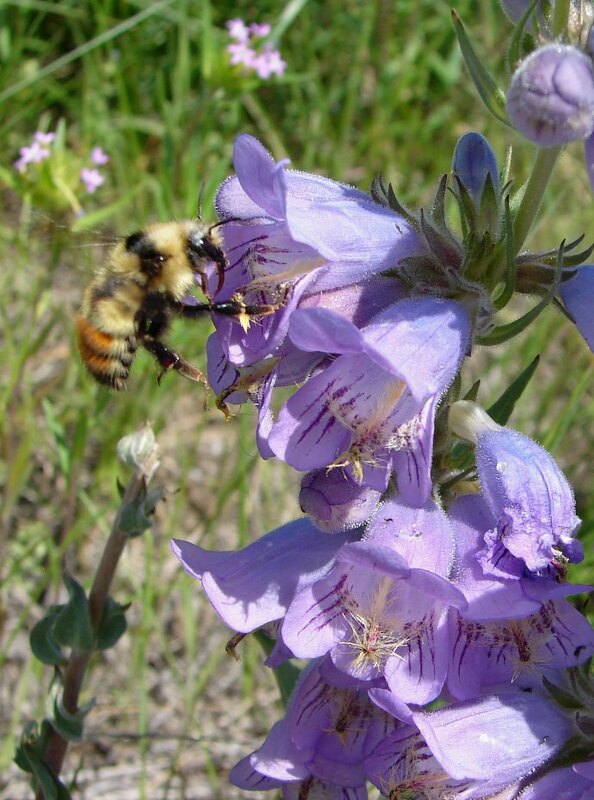 Bumblebee visiting Fuzzy-tongued Penstemon (Penstemon eriantherus), a native wildflower of western Montana. Photograph June 2012 by Eric Edlund. These weeds are pretty distinctive, so you don’t need to worry too much about taking out innocent native bystanders. But if you have any doubts, check some online resources for identification guides. Missoula County’s weed identification page is a good place to start. Houndstongue looks a little bit like our native bluebells and penstemons (see image at right–that’s a native plant! ); spurge and toadflax plants look a little bit like a weedy native species called gromwell or stoneseed. I don’t think you could confuse whitetop with any desirable native plant, but while you’re checking it out, keep an eye out for yarrow growing alongside the trails. It has small white flowers and fuzzy basal leaves (these leaves are nothing like whitetop leaves). Yarrow is a widely used herb in traditional medicines. Enjoy Missoula’s open space, and thanks for helping to take care of the Rattlesnake Watershed. If you enjoyed this post, check us out on Facebook. The RCWG works on a variety of watershed protection issues, including water quality, invasive species, black bears and fruit trees. Posted on June 11, 2012, in Uncategorized and tagged plants. Bookmark the permalink. Leave a comment.